Disfruta de un delicioso almuerzo y acompañamiento de refrescos. First off, if you cruise on Carnival or 1 of its other cruise lines, I highly suggest booking through them for Mahogany Bay. If you book through a 3rd party in Mahogany Bay, it is pretty much hit and miss and very hectic trying to find where to hook up with your tour. Directions/Instruction from Viator were sub par and it took my wife and I about 30 minutes just trying to figure out the meeting point. All we were told by others was to climb up the hill and your tour will be waiting. Upon climbing over the hill, there must have been 40-50 people standing along side a road with signs. No one knew of "Viator" that was printed on my travel voucher, but we finally figured out that we needed to ask for Roatan Anderson Tours. Once we solved that problem and found someone among the 40-50 people, I was told that I was not on their list. After waiting for 30 minutes, they suddenly found my reservation and was having a driver come pick us up. Another 30 minutes goes by and a small Toyota pulls up and one of the people standing on the side of the road said that was for us. My wife and i were both a little apprehensive at this point, but we got inside the car and proceeded to leave the area. The person driving was very friendly and we drove for about 2-3 miles when I ask where he was taking us. He said it was up to us, but I thought this was a bus tour, not an individual guided tour. We drove to a couple of gift shops, made a quick stop on a scenic hill and stopped at a chocolate factory and a rum factory. The chocolate factory was fun, but the rum factory had no air, had a sewer smell, and I thought the rum tasted like a cheap blended rum. At the end of the tour our guide took us to a very nice and clean beach, but it was very crowded. We decided to forego the beach and just head back to the ship at this point. Our guide was very pleasant, and the a/c in the car worked very well, but I would not recommend this tour. Our tour with Roatan Anderson Tours) began as expected meeting our guide who then walked us over to our vehicle for the day. I immediately noticed the small spare tire on the left rear of the vehicle but figured the guide probably had a rough day and hoped we didn't get a flat tire. We visited a chocolate and rum factory along our route and purchased items at both. We were then taken to a pretty cool restaurant along a hillside that also doubled as a zip line business. We had a nice view of our ship from this location and a good lunch as well as watching people zip lining pat us. We then went to a beach (Las Palmas) nearby which I did not recognize but figured the guide new where we were going. Upon arriving, I asked him about the beach and he advised the tour group owner had told him to take us to this beach instead of Tabyana Beach. We made an attempt to enjoy this beach but only lasted one hour here. It looks like they have been trying to convert a waterside property into a beach by dumping large amounts of sand on the beach and placing lounge chairs along the water. They had a bar and music as well as some water activities to rent but the water quality was poor and full of sea grass. 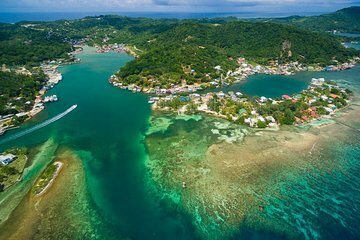 I sent Roatan Anderson Tours an email upon returning to our ship advising how unhappy we were with our experience. They quickly responded apologizing for having taken us to this beach. They further advised that hey had taken us to this beach because they had received bad reviews about vendors at Tabyana harassing guests. I responded that I should have been asked what my wishes were. I speak fluent Spanish and had no problem telling vendors to leave me alone. They agreed and apologized and stated they would no longer take visitors to Las Palmas beach and offered me a 20% discount if I returned. I'm relieved that future guests will not be subjected to our experience but disappointed that our visit to Roatan was not good. Beware doing business with Roatan Anderson Tours. My wife and I had a great time in Honduras. The Island is beautiful. Our tour guide was extremely knowledgeable about the island. We will book this excursion again.